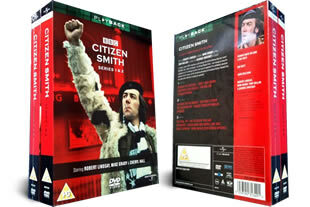 Citizen Smith DVD set, containing the complete series 1-4 (all that was ever made) on 6 DVD's. DELIVERED FREE IN THE UK when you spend over £15. Please note this is 2 seperate DVD sets. Follwing 'Wolfie' (Robert Lindsay), Citizen Smith is based in London. Wolfie is a young communist 'urban guerilla' who tries to emmulate Che Guevara with his group of friends (known as the Tooting Popular Front), trying to give power to the people! 6 DVD set delivered to your door.